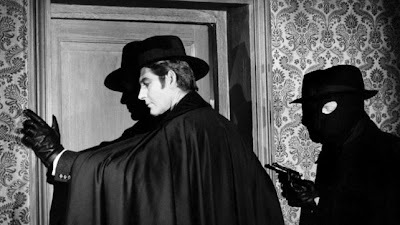 Georges Franju directed this supremely stylish revival of the French pulp series by Louis Feuillade about a mysterious moral avenger and master of disguise who dishes out vigilante justice to the powerful and corrupt. Preceded by a well-loved silent serial in 1916 shot by Feuillade himself, Franju's remake casts American magician Channing Pollock in the title role, a individual whose countenance is as stern as that of the buzzard mask he sports in the iconic still above. Judex, who usually favours a slouch hat and cloak, has his sights set on villainous banker Favraux (Michel Vitold), a cruel and avaricious blackmailer. Our hero harasses his mark with poison pen letters (a detail recalling Henri-Georges Clouzot's Le Corbeau, 1943) before faking Favraux's death at a masked ball and kidnapping him. However, Judex's actions only prompt the latter's black-hearted mistress Diane (Francine Bergé) to rob the financier's estate, a plot that ultimately endangers the life of Favraux's gentle daughter Jacqueline (Édith Scob, whom you might recognise from Franju's horrific Eyes Without A Face or indeed last year's Holy Motors). A convoluted mystery ensues, played with admirable seriousness by all concerned. Franju was a master image-maker and Judex is filled with witty visual touches. Two women, one a cat burglar all in black and the other an acrobat in a white leotard, fight it out on a moonlit rooftop. The amiably doltish detective Concatin (Jaques Jouanneau) sports a deerstalker cap and chuckles over a well-worn copy of Fantômas, (another Feuillade-directed series) at his desk. A disguised nun lies stricken in the road, waiting to trick an ambulance driver into braking so that she can jack him at knife point. Excellent stuff, in other words. 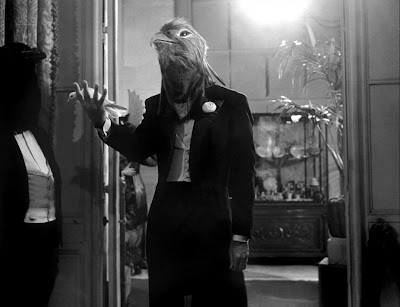 Perhaps the highlight though is the surreal costume party scene, which was inspired by the work of caricaturist Jean-Ignace-Isidore Gérard Grandville, who mocked bourgeois manners and mores with his 1829 book Les Metamorphoses Du Jour in which his fellow countrymen are depicted with the heads of beasts, fowl and grasshoppers for satirical purposes. Judex is available on DVD from Eureka, whose Masters of Cinema release also includes Franju's later but similarly styled Nuits Rouges (1974), an inventive but terminally naff mystery concerning a criminal mastermind in a scarlet balaclava, brainwashed henchmen, a host of silly gadgets and the lost treasure of the Knights Templar.